This probably doesn't apply to coach owners as much as you have probably been running the chassis heater during your drive. However if you have a trailer the inside can be pretty cold when you stop. How many of you who have generators, either built in or portable will run the generator when running the trailer's furnace, and if your generator is large enough even run a small electric heater? Just hit electric start, plug in power cord, and converter runs furnace and extra heater rather than batteries. Inside of TT heats up rapidly and when I hit the "snooze button" I'm not doing so after the batteries have had to run the furnace almost continuously up to that point. In my mind I have a better chance of making it through the night on the batteries. Also, If my Tow Vehicle hasn't recharged batteries fully from previous night's use, the Converter/Charger finishes topping them off. I have 2 6-volt batteries that can easily run the furnace for 2-3 nights. If I didn't, i would have no prob running a gen. Most 18 wheelers leave their trucks running all night. Slept at a rest stop on a trip to orlando in 05 between two trucks. The hum of those diesels put me right to sleep. They would have never heard a gen.
Roger that. When ready to sleep I sleep. I will say that my "inverter" is a lot quieter than an idling diesel or even a refrigeration unit. Different batteries but same plan for me. I prefer not to run the generator as I have a battery bank that stands up to anything I throw at it. BUT, I've also ran my generator all night when we needed A/C. I added carbon monoxide detectors in each bedroom and have the factory one in the living room. Same as the others. The battery bank was specifically planned to support 4 nights@5 hrs/night of heater use without recharging. Of course, an A-frame has much less volume to heat and a less powerful fan so 2 GC-2s is all I need. With A-frame fridge and water capacities, dry camping 4 nights in the same spot is about the practical limit anyway. What are the chances of getting a couple pictures of your gen mount without the gen installed and how you attached it to the frame ? I built a rear platform for my Genny and gas cans. Love to be able to stop along the road for lunch and a nap and have air conditioning available. 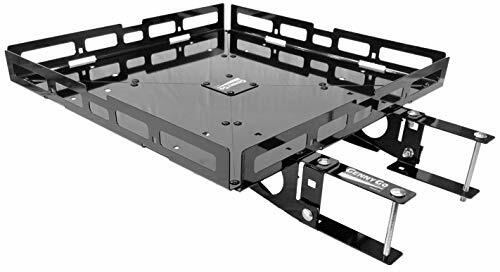 Platform is attached to a pair of 1-1/4" receiver tubes that I welded to flat plate steel sandwiched between the rear stabilizer jacks and the existing frame plates. Easy to remove if needed. Also put the safety struts on the frame end to provide more support for the bumper. I bought the "all Steel" unit that will carry around 200# one foot back from the bumper. The company rates these in "foot/lbs" as a heavy load on top of the bumper is not as problematic as the same load on the outer edge. Since my gen/inverter weighs just over 100# I'm well within limits. 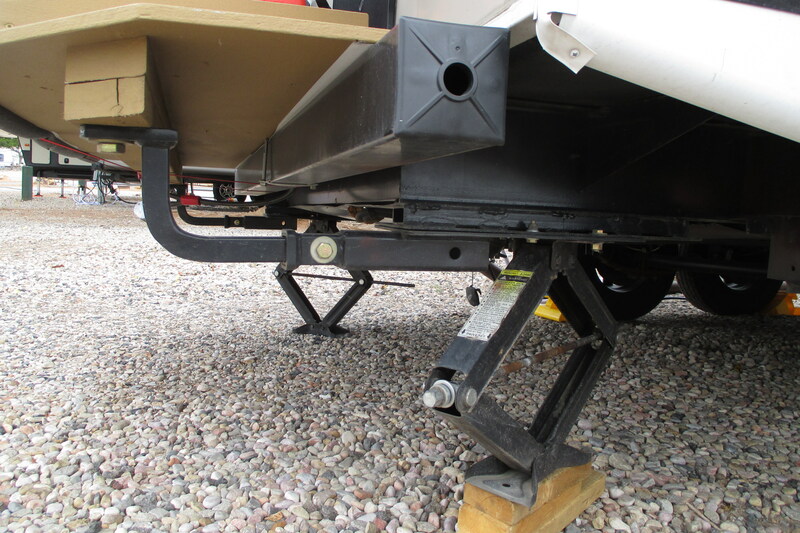 Safety Struts are just over $70 for a pair with mounting hardware. Generator carrier was $189 on Amazon. Decided to buy ready made rather than having to "Engineer" then fabricate, paint, etc. 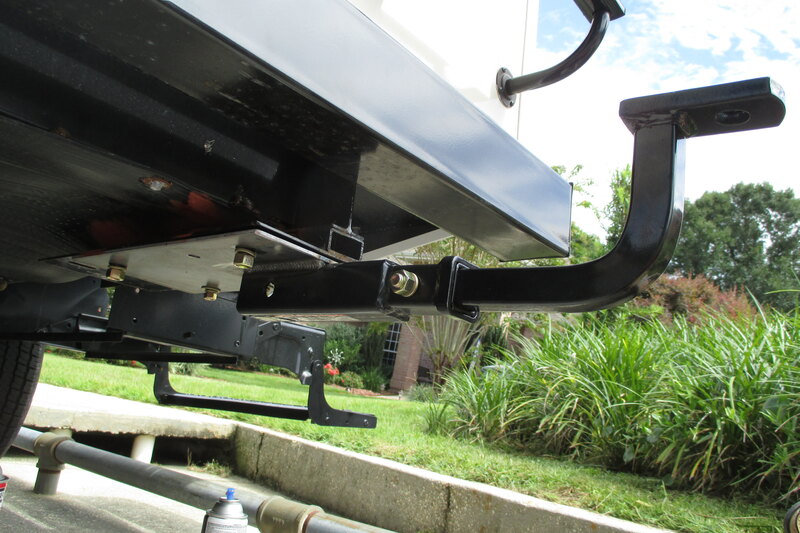 When I installed the platform I then parked my 186# backside on the outer edge and bounced on it. No movement whatever, not even flex in the bumper. Two ratcheting tie-downs to keep the gen/inverter from moving while traveling and two 3/8" Master "Python" Cable locks to keep it from "walking away". No need to move it from the platform as it sits far enough from the back of the trailer and ladder that exhaust doesn't heat either up. Noise inside is no different than any other "onboard" generator, Onan, Generac, Etc. BTW, you can buy the mounting "brackets" only. They are sold separately for ~$80 on Amazon (pair) and you can build your own deck. If you are going to carry gas cans get two sets and evenly space. Use a piece of 3/4" plywood for deck and some 2X4 for "edging. 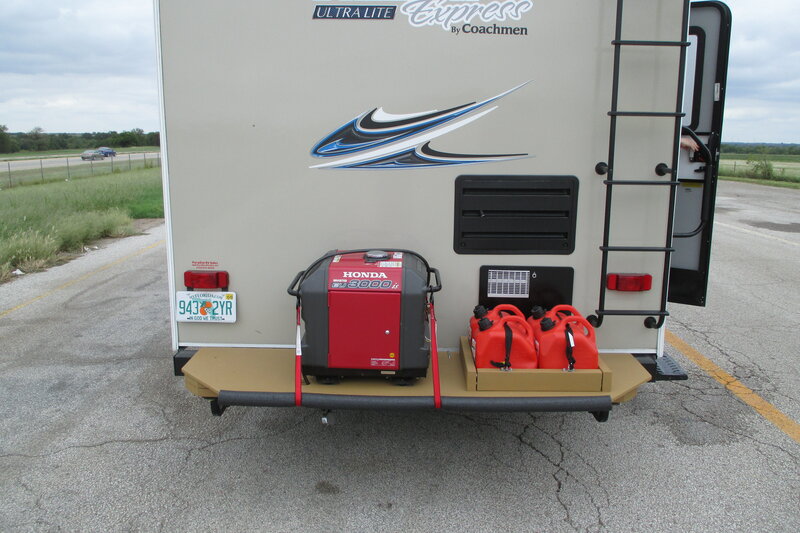 I carry my gas cans and propane bottles (Dual Fuel Inverter) in the truck. Figure I'll be putting them there when I go to town for more fuel and won't have to tow the TT. Your setup looks good and not real difficult to fab. and install. What terms did you use to search for the platform and the safety struts ? Over the last few years I've found that you can often spend as much for material to fab something as you can to just buy something similar. A little extra paint for a second coat and you can be good to go. Years ago when I ran the race car I had all kinds of raw material lying around. Throwing something together was a pretty easy task but today there's not much left in the material pile any more.